Timberwolf Extreme Wax Dog Coat. 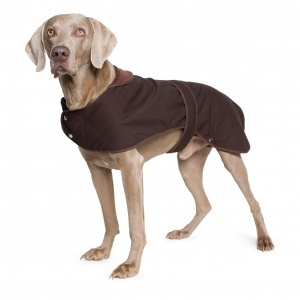 All weather superior quality waxed cotton dog coat. The Ancol Muddy Paws Extreme Wax Coat is from the prestigious Timberwolf range. The Timberwolf Extreme Wax Dog Coat is inspired by traditional blanket-style coats and is designed to keep your dog comfortable in all weathers while allowing freedom of movement. To ensure water-resistance the upper layer of the coat has been treated with a fine covering of wax, keeping the dog dry by acting as a barrier to rain and splash water. The coat is insulated with a quilted padding lined in a classic blue tartan to keep your dog warm in cold weather. The Timberwolf Extreme Wax coat features a range of details and embellishments to make the coat efficient and stylish. Velcro tabs at the waist and chest and elasticated straps with Ancol-stamped press studs allow the coat to be affixed securely and close to the dog's body while allowing for fuss-free removal and freedom of movement. Reflective edging ensures your dog remains visible in low lights, increasing their safety while walking at night.